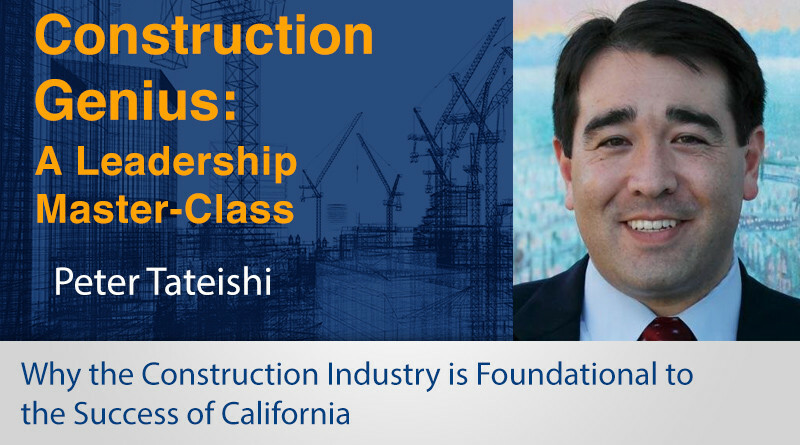 Recently, Peter Tateishi, CEO of Associated General Contractors (AGC) of California, sat down with Eric Anderton for a candid, wide-ranging discussion touching upon AGC’s newly revised mission, and the practical actions the organization is taking to fulfill that mission. Along the way they discuss the roadblocks state government is throwing at new development, and the need to change perceptions of the opportunities available in the construction industry. Construction’s role as the number one foundational state industry, upon which other industries are built. Without construction’s infrastructure, Hollywood and Facebook can’t exist. The common misconception that construction is the industry of last resort for job-seekers, and the actual wealth of jobs and opportunities available. “Without construction,” says Peter, “there is no California.” The state needs infrastructure to attract future generations of business leaders. AGC’s focus on fighting for a place at the table, to shape government policy that will support business. AGC’s role in in passing SB 1, a bill reserving billions of funding, reserved for maintaining current infrastructure. AGC’s role in the No on Prop 6 campaign, to defeat a measure that would have killed SB 1. When construction builds, California has jobs, opportunities, and economic growth. The need for the industry to better communicate those opportunities to government leaders and others. The distinction between plain advocacy, and shaping policy. Peter’s background in politics as Chief of Staff to a U.S. Congressman. AGC’s opposition to Project Labor Agreements, which cut contractors and business owners out of negotiations. The current governor’s recent efforts to hobble the distribution of SB 1’s funding by tying it to affordable housing requirements. AGC’s new program, Build California, launching this summer, which will focus on changing the perception of the industry, and educating the public and job-seekers about the opportunities available. Build California’s modeling on the U.S. military’s successful efforts, through advertising, to change misconceptions about the opportunities available to those who enlist. Current culture’s attraction to the camaraderie, sacrifice, and challenge one can find serving in the military, and the parallels there with the construction job site. Peter’s evident passion and drive to change, strengthen, and magnify the positive impact of the construction industry. The need for all voices in the industry to be heard and to join the fight.